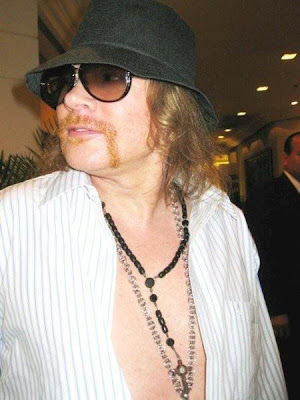 gunsnfnroses: Axl: "GN'R Was Sabotaged"
Axl Rose claims music giant Irving Azoff concocted a diabolical plot to destroy Guns N' Roses. Rose just filed a countersuit against Azoff - his former manager - claiming Azoff tried to strong-arm Rose into a reunion tour with the original members of GN'R. When Rose nixed the idea on the heels of the Chinese Democracy tour last year, Azoff did everything he could to screw Axl ... so he claims. Among other things, Rose claims Azoff tried "devising and implementing a secret plan to set up Rose and the band for failure so that Rose would have no choice but to reunite with the original Guns N' Roses' members." Rose believes Azoff was so vicious he even used Axl's childhood name - something that carries heavy emotional baggage - when he filed the initial lawsuit for commissions. Rose says the name William Bailey "carries significant emotional damage from Rose's childhood" and that Azoff knew it because of numerous personal and confidential conversations. Rose is countersuing for $5 mil minimum. Axl Rose says his former manager tried to implement a scheme to force him to reunite with the original Guns N' Roses band members and, as part of the plot, failed to properly promote the "Chinese Democracy" album, lied about a prospective Van Halen super tour and mishandled the band's tour dates. The claims are part of a bombshell countersuit filed yesterday against Irving Azoff's Front Line Management. In March, Azoff sued Rose, claiming the rocker violated an oral agreement to pay 15% of earnings, or nearly $2 million, from a lucrative concert tour. Not since the G'N'R song "Get in the Ring" has Rose struck back at a foe so forcefully, alleging antitrust concerns about Front Line's parent company, Ticketmaster, to drive home a major claim that his former manager is up to no good in the music business. Azoff is CEO, director and majority shareholder of Front Line, whose roster of artists include the Eagles, Neil Diamond, Jimmy Buffett, Christina Aguilera and John Mayer. In 2008, Front Line was acquired by Ticketmaster. Rose claims that through Azoff's control of the "trifecta" of artist management, concert and touring promotion, and ticket sales, Azoff has been able to gain wide influence and power in the music industry. Azoff allegedly decides what artists he wants to promote through favorable touring deals and uses his power to punish artists and harm their careers if they don't follow his orders. When informed of the myriad allegations in the countersuit, Azoff's lawyer Howard King quipped to us: "He didn't accuse Irving of being on the grassy knoll in Dallas on November 22, 1963?" The countersuit invokes the U.S. Justice Department's recent antitrust lawsuit that sought to stop a proposed merger between Ticketmaster and Live Nation over concerns about the new entity having too much control over artists and venues. Afterwards, Ticketmaster entered into a consent decree with government regulators to allow the merger to continue under certain operating provisions. Axl's counter-complaint says that Azoff is violating the consent decree by coercing and bullying artists to do what he wants. What Azoff wanted, the rocker says, was the reunion of Guns N' Roses. To execute this, he would sabotage Rose and his new band so that Rose would have no option but to reunite. According to the filing, "Upon realizing that he couldn't bully Rose and accomplish his scheme, Azoff resigned and abandoned Guns N' Roses on the eve of a major tour, filing suit for commissions he didn't earn and had no right to receive." Further, Axl says the botched tour cost him money in production startup and rehearsal expenses. Claiming breach of fiduciary duty, constructive fraud and breach of contract, the singer wants at least $5 million in damages. The cross-complaint was filed by Skip Miller and Sasha Frid at L.A.'s Miller Barondess. As great as Chinese Democracy was, the original Gn'R was so much better. Appetite For Destruction is widely regarded as one of the best - if not the best - hard rock albums ever. There is nobody out there who would honestly want another Velvet Revolver or pseudo-industrial Guns album. Azoff was merely catering to what the fans want most. Slash is opening for AC/DC in Paris when Guns and AC/DC co-headlined in the '90s. Bring back the original (and best) Guns N' Roses. I applaud Azoff for trying to do what is truly best for us fans. Unfortunately, I think he may have gone about it the wrong way.